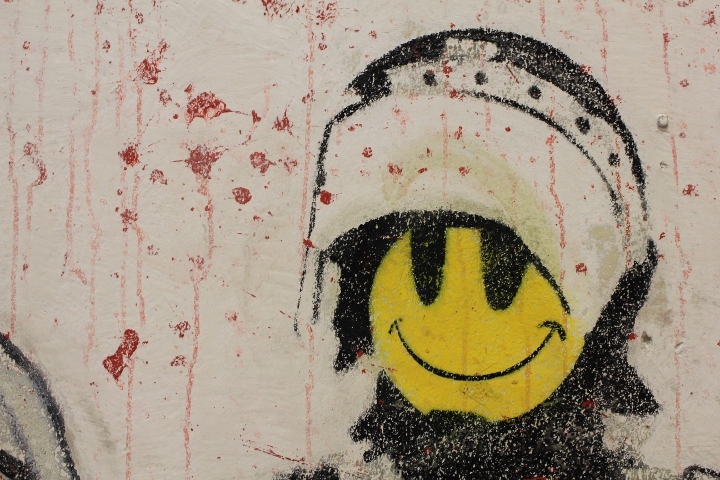 In the year 2003 the most famous Street Artist in the world: „Banksy“ has been in Berlin., for the Backjumps exhibition. 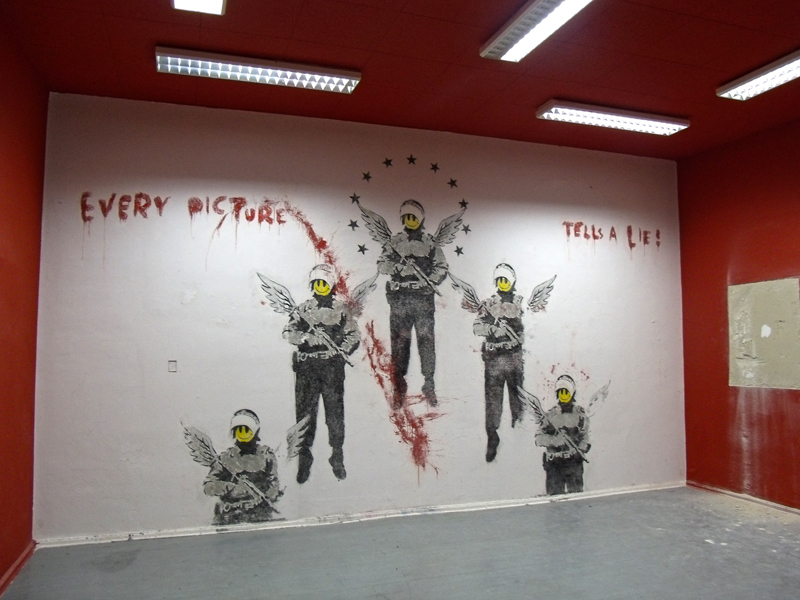 The artwork „Every Picture Tells A Lie“ was created in 2003, shortly before he became famous and the Street Art fever infected the society through the movie Exit through the Giftshop (official trailer). It was painted for the Backjumps (Issue #1) exhibition in 2003. Since then, it was slumbering for more than 8 years under 20 layers of colors in the Art-House „Bethanien“ which is located in Berlin Kreuzberg. 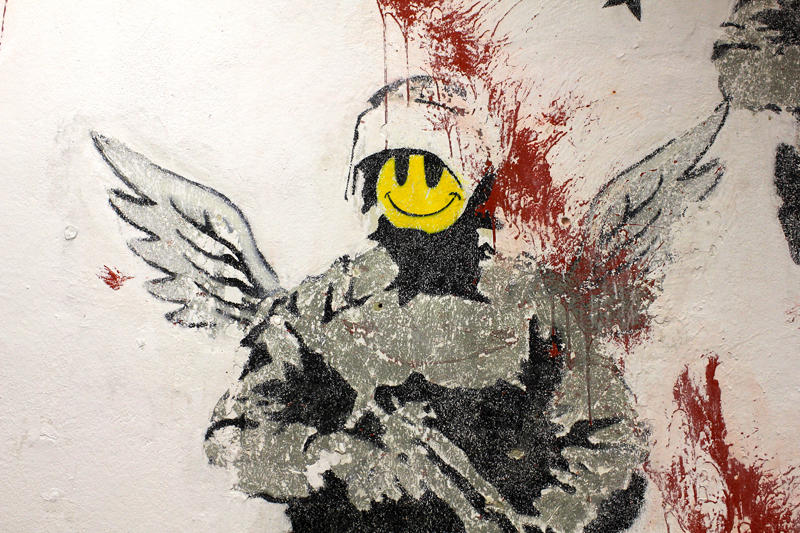 The idea to restore Banksys work was impacted by Brad Downey, another well known Street Artist. The idea of Downey for the exhibition was an project which was called: „What lies underneath“, probably because Banksys fame has been spread like the pest after Street Art has become an established art form and a serious movement He got invited by the famous Street Art curator and activist Adrian Nabi invited Brad Downey for an new exhibition which was called „Do not think“. So, did Banksys artwork „Every Picture Tells A Lie“ got restored because it was provoking to became a magnetic location for „Street Art Safari“ customers, Street Art collectors or Banksy groupies, visitors magnate or is it about the content, the ideas and creativity which lies underneath. Street Artist Brad Downey said that it was like a time travel for him, it was his first exhibition ever in Europe. 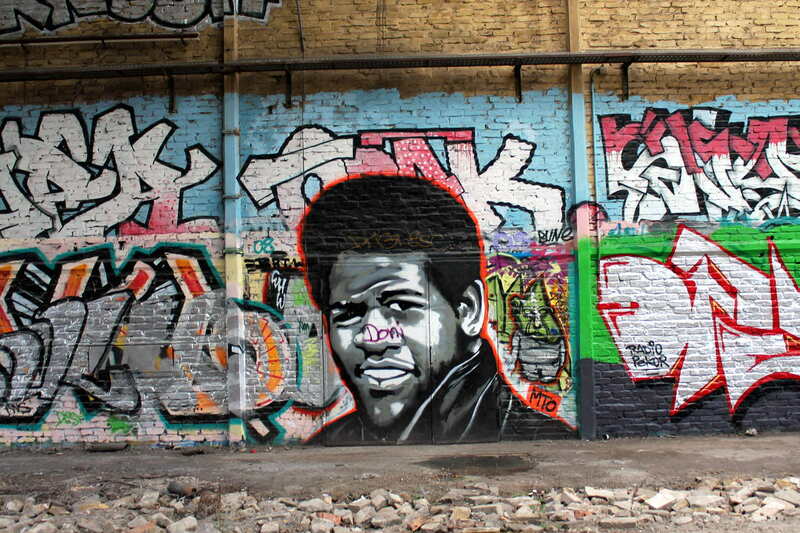 The time were the Street Art on its own was unknown and noncommercial. „What lies beneath“ was a criticism about the whole Street Art scene and fans. After the restoration, something happened what was probably provoked. 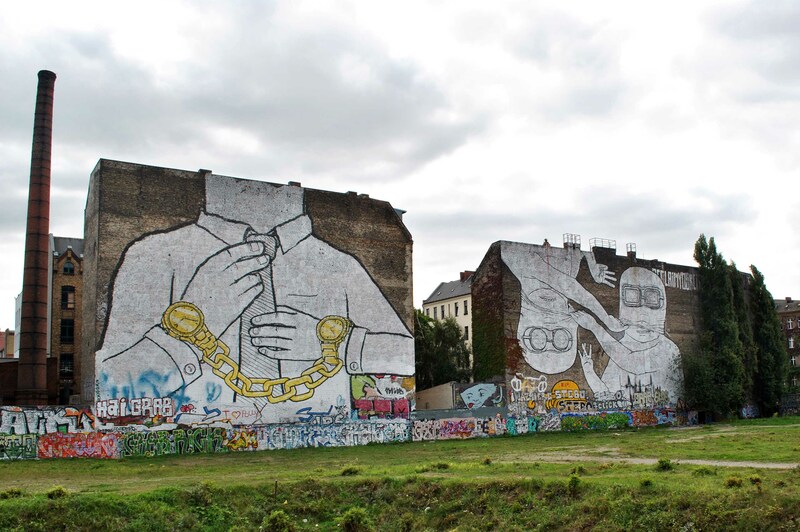 It became a short time „Mecca“ for tourist, Street Art fans, and the press, because Banksys Street Art movie which infected everybody, even people who have seen Street Art as vandalism instead of art.In the time Banksy has created his artwork in Berlin, it didn’t got a lot of attention. 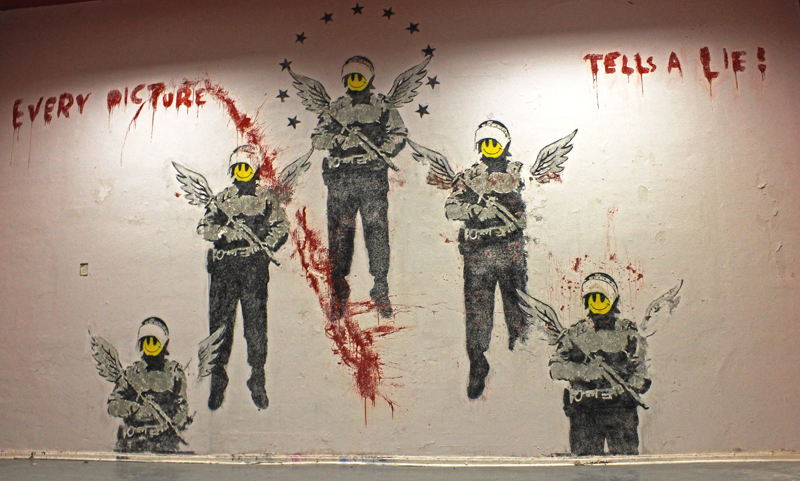 But after Street Art was the „new hype“ and Banksy became the known Street Artist, he is today in the world. Banksys Artwork „Every Picture Tells A Lie“ got an incredible amount of visitors, who just came to see the works of Banksy while the visitors disregarded and ignored all other artworks, exhibitions which have been running in the same building. Pingback: Backjumps, the Street and Urban Art Show as children special!